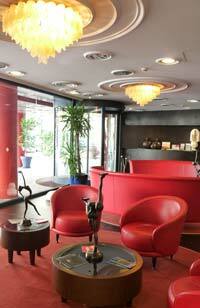 Abitart Hotel is a four-star design hotel close to the Via Ostiense in Rome. The hotel is modern and stylish, with comfortable rooms and international standards. I stayed at the hotel for two nights in autumn 2009. I booked a double room for single use at the surprisingly cheap rate of €89 per night, offered online. 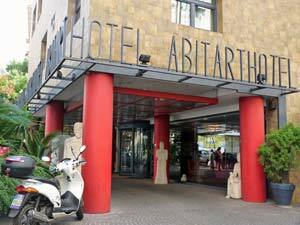 This was comparable with hotels of a much lower category, and quite a bargain for Rome. Although the hotel is not in the historic heart of Rome, it is in a busy central district with good transport links and some interesting sights. Arriving from Fiumicino Airport is easy, although the approach from the station's side entrance was unappealing at night (read on for more about the location). Arriving at the hotel was a pleasant experience, however. Very unusually for Rome, the hotel is a self-contained, modern and purpose-built structure, and stands out stylishly among the dull urban blocks of this part of town. Curious dumpy statues adorn the pillars outside, and the hotel's large lobby was bright and welcoming. I was greeted by an efficient receptionist who gave me my room key and directed me to the lift. Disappointingly, the hotel restaurant was closed on Sunday evening, so I had to leave these comfortable surroundings to find food. My first-floor room was bright and stylishly decorated in green with bold sculptural light fixtures and full-length green curtains along one wall. 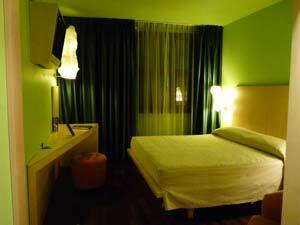 It was comfortable and modern, and of a much higher standard than a typical Italian four-star hotel. 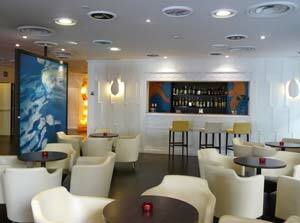 The 'design' aspects of the hotel gave it a contemporary feel but did not compromise the comfort of the accommodation. One wall of the room was interestingly undulating, though unfortunately the flat air-conditioning vent was stuck on awkwardly and rather spoiled the effect. The double bed was comfortable and made up with good-quality linen. Furnishings and fittings included a flat screen TV with a few international channels, an art work and a mirror on the wall, bedside shelves, wardrobe and suitcase stand, a triangular desk with power points and a soft stool to sit on and an armchair. The room had adjustable air-conditioning/heating. There was no real view: a window looked out over a low roof towards another bulding. My bathroom was large and smartly decorated, with a good shower and decent toiletries. There was a clothes line in the shower which would have been convenient had it been fitted better. I arrived in the evening and missed out on the hotel's turn-down service. On my second night, however, I returned to find my room cleaned and tidied, with all the toiletries replenished, the bed turned down, a 'good night' message, an apple (thoughtfully healthy) and a smart pair of black hotel slippers. There were only a couple of things which I didn't like about my room. One was the bedside calendar featuring 'arty' photographs of women's bottoms (thoughtfully replaced by the cleaner after I had removed it from sight), and the other, more serious, was when I attempted to have a shower before bed and found the water was only lukewarm; by morning it was back to full heat, however. I also felt that, given its efficiency and appeal to business clientele, it would have been useful to have had a proper chair at the desk, and a larger, laptop-sized room safe. Apart from these quibbles, I thought the room was a very comfortable environment for relaxing after a busy day in Rome. It was peaceful; the only noise came when other guests talked just outside my door. Unfortunately there seemed to be a tour group leader in a neighbouring room, with frequent visitors. Breakfast was taken in a pleasant glass-walled space on the first floor, with foliage outside and wooden flooring giving a pleasant 'garden' atmosphere. Guests helped themselves to coffee from a big urn, or made their own tea with hot water from another urn - this was rather fiddly as no teapots were provided and the only cold milk was in a big jug over by the cereals. There was a good range of tea bags, though. The buffet food selection included delicious mini pastries, rolls, cheese, cold and hot meat, warm scrambled eggs, cereals, yoghurts and fruit juice (orange juice was freshly squeezed but watered down). On my second morning there were just solitary business people dining and the staff ran around replenishing the depredations of a big tour group. The hotel's public spaces were well-kept and smart, though I didn't care for the scent of aftershave which pervaded the corridors. The ground floor entrance and bar area was spacious and comfortable, with plenty of seating, magazines and artworks on display. The Abitart does have a restaurant, but as I didn't eat there, I can't comment on its food. There is a choice of places to eat close by on Via Ostiense, from fast food to nice sit-down restaurants. The hotel provided free wireless internet access. Hotel address: Via Pellegrino Matteucci, 10/20. The local train from Fiumicino Airport - which is cheaper than the non-stop express service - stops at Ostiense station, a very short walk from the hotel. Leave the station through the side entrance signposted 'Via Pellegrino Matteucci' (the escalator didn't work when I visited), then walk down the street on your right, crossing over to arrive at the hotel. The Abitart's location is a few yards from the busy multi-lane street Via Ostiense; turning right will bring you to Rome's pyramid, opposite which is Piramide station, a stop on Metro Linea B and also the terminus for trains to Ostia Antica and the seaside. Rome's main station, Stazione Termini, is four stops away, and the Colosseum just two. Bus services, such as the 30 express, run from the station into Rome's historic centre. As well as the pyramid, other sights within a short walk of the hotel include the most unusual and striking of Rome's museums, the Centrale Montemartini, and the peaceful Protestant Cemetery. One of Rome's liveliest nightlife areas, Testaccio, is also close at hand. I really loved the contemporary style of the hotel, and the high standard of the accommodation. It is quite rare in Italy to find such a good, comfortable, modern bedroom. The online price I paid was a very good deal, and although the hotel was obviously aiming to be competitive, no corners had been cut: furnishings and service were excellent quality. The hotel evidently appealed both to business travellers and to tour groups. The location is in an ugly and traffic-filled part of Rome, and the city's principal sights are a bus or Metro ride away, so the Abitart wouldn't suit every holidaymaker. But for a comfortable stay in modern surroundings, the hotel is a good base for visiting Rome, especially if you find a good deal online. Abitart Hotel review by Italy Heaven editor.